Board Games, Simulate a safe learning environment. Learn to build an excellent financial report card. It's so easy with Cashflow101. Play Pictionary in teams and learn the hidden talents of your team members. in the section 'Learning Games for Kids'. The first board game is useful to help kids learn safe, money growing techniques in investment. Out of the two learning games listed here I am very excited about this particular one. 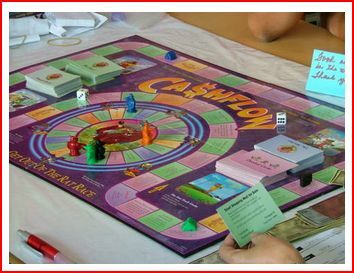 Eversince I came across Cashflow101 I have played it with my family and friends. I have learned something new from it everytime I played it. The most recent learning for me has been to save enough money before starting to invest. It was so significant that I won the game in little over an hour. The creator of the game Robert Kiyosaki claims that a person who wins the game within an hour has increased her financial IQ considerably. A feather in the cap for me eversince I started playing this game is that it has enabled me to take risks. I have been playing this game since 2003 now. I have since invested in the stock market and made quite a few wise investments. All except two(out of a total of 10) rose in the market. I had set my exit levels low, somewhere around 20% gains. As soon as I hit my exit level I sold out and made money as well. Since I started to play this board game I have also realised the importance of 'tithes and offerings' (Charity and more) as the foundation for growing money. I realised that giving is like sowing seed. The more you sow in good soil and water it, the more you will receive. There are quite a number of learnings that one can get out of this board game or learning game. Let's look at some of the basics of playing the board game before looking at other important learnings. It requires a minimum of three players to make it interesting and not more than six players can play it at any one time. Anyone who is 10 years or older can play this learning game. Children learn lessons quickly and at an early age. My eight year old understands the importance of giving having played this learning game. He has also learned to ask meaningful questions as to why I am advising him not to go through with certain deals in this learning game. The ideal number of players for this board game is four. (I can hear you saying, 'You just said six!'). Yes but believe me the ideal number is... four. This is one of the drawbacks of this game. Although technically six people can play it at a time, the game takes a long time (three hours if all the players are novices in the game, or one hour if some of the players are good at it). The reason the games takes time is that every time a financial transaction is made the player has to make adjustments to his balance sheet and get it checked by his auditor(another player in the game). Actually come to think of it, the game is very life-like. Adults are meant to take time to document their financial transactions. Only financially intelligent adults do it. So in a way I am glad that the game teaches you to do that and four players is a good number for the game. Talking about being lifelike, in the course of the game, players have babies, go through downsizing, credit card debts etc. Through out, the game really forces you to examine your decisions in the light of the consequences. It also shows up weaknesses like 'doing the same thing over and over again' inspite of the fact that the results are not profitable. One of the crucial ways of learning from the game is to reflect on the consequences of your actions, and using these learnings in the next sitting. Otherwise you are likely to repeat the same mistakes and become frustrated with the game. The game basically involves rats who are working to get out of the 'rat race'. (Now that makes sense. You've got to be a rat to be in the rat race). In the rat race, a rat gets a periodic paycheck which she uses to save, pay expenses(both capital and doodads). To get out of the rat race the rats have to make a monthly passive income that is more than the monthly expenses of the rat. As soon as the rat reaches this point she is out of the rat race and gets on to the fast track. Here she plays to earn enough to buy her dream (the value of which is in hundreds of thousands of dollars) or owns enough businesses that will secure her for life. When she reaches this stage, she has won the game. There are e-versions of this game available too. Once players have become adept at playing this game, they can move on to the advanced version of the game. There is a kids version of the board game as well as an e-kids version. Children from seven to ten year olds can play the kids version with considerable enjoyment. In the e-version, there are teacher guides for teachers who would like to use this game in the classroom. For the family version, the video tape and the instruction booklet is quite detailed and self explanatory. This learning game has been found to be quite useful in schools wanting to equip students with the financial life skills that they need to be successful. Schools have failed miserably in this area till date and learning through this learning game more than fills that gap. Below is an excerpt from Robert Kiyosaki's book 'success stories' which illustrates the point that I have been making in this article. I wanted extra money to spend. To make that happen I decied to start my own business. I was nine. I learn a lot in school, but from the Rich Dad tapes and the game I saw that it's possible to start your own business no matter how young your are. First I sold rocks to the neightbors for aquariums and decoration. My mom thought it would never work but I went door-to-door and I did make some money. And like Robert's rich dad and my mom told me, I kept track of what I spent and what I earned. Then I decided to sell candles. I made some for my third-grade Christmas party and liked doing them. First I tried to sell them door-to-door and on the street, but I wasn't very successful. Then I decided to sell them on the Web, where age doesn't matter at all because nobody ever saw me. I became a business owner. My mom helped me set up a Website. I made up business cards and handed them out at school and at church. I bought what I needed by saving my allowance. As soon as I received an order I made the candles and shipped them out. I feel like I can accomplish a lot more by listening to what rich dad says. Finding my own way to do things isn't hard. I know I can take something I like to do, turn it into a business, and make it work. I also understand that if I put my mind to something I can accomplish it no matter what happens. I even got all As on my report card! If you would like to know more about Cashflow101 and how to use it in your school/home, or if you want to have a training programme for your teachers so that they can learn to use it with the students, please use the Contact Us page. Another achievement in my life that I attribute to the learnings that I have got from this game is my purchase of Site Build It! (SBI!). This board game - truly a learning game - teaches you to identify a profitable investment when you see one. SBI! is one such. As I update this page I have been using SBI for nearly three years now and have written 67 pages on this website. Already my homepage is the first among 258,000 odd sites on Google search for the keyword 'experiential learning games'. I earn nearly $554 (INR 25,000)every month from this website - which is a considerable amount of passive income. To know more about how you too can earn passive income from SBI take this 'Quick Tour Slide Show'. A fast step-by-step demo of how SBI! works. 2. Team Pictionary: is another of the board games (an example of kids learning games) which basically involves the Pictioanry game board. This is to be played in teams and is a very useful way of teaching visualisation. Visual representation of words is an important right brain activity. It helps children learn the meaning of words better. It also allows them to do some active experimentation with the meaning of the words as they understand it. This completes the experiential learning cycle and the words are processed to a very high degree. This board game or learning game is an excellent tool that will develop visualisation ability among children. You can have two to three teams of 5 players each to play the team Pictionary. There is a game master (the teacher) in the game whose role is to proceed with the pawns on the board where each pawn represents a team rather an individual. This board game 'Team Pictionary' can be played effectively with students who are ten years or older. As the turn of each of the teams in this board game comes around, a representative player is chosen to step-up and represent the word in the card as a picture by drawing on the white board. The rest of the team does not know the word so has an equal chance to score in the round. In this board game or learning game the team that first guesses the word scores ten points per word. The scores are written on the score board round wise for each of the teams. At the end of this board game the scores per team are summed up and team wise totals recorded. The team which gets the highest number of points at the end of the game wins the game. In a school setting the game may be restricted to the number of rounds required to give every student a chance to represent her team. The fun part in this board game or learning game happens at the time of pictorially representing the word on the drawing board. You'll see a variety of stick figures, some realistic drawings, and some wild gesticulating actions to help the home team make meaning of the word before the other teams do. The race to guess the word first is very exciting. Once again these board games are a great way of providing children with the experience of experimenting with their learnings in a safe game environment. 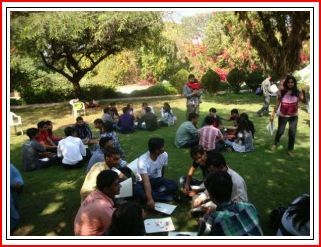 The quality of these experiential opportunities will help in retention of learnings through their lifetime. For more on these board games and other board games or learning games Go to Contact Us page and let us know what you are looking for.